After subjecting myself to a dose of Sen. Mark Begich re-election television ads — somebody pass the NoDoz, please — only a few questions remain. When is this guy going to cure cancer, prevent ingrown toenails and take a moment out of his hectic schedule to silence the guns in the Middle East? He takes credit for just about everything else — well, except for the mess he left behind in Anchorage as mayor and his critical Obamacare vote as senator. One of his ads has him zipping across the frozen tundra on a snowmachine west of Deadhorse in below-zero cold. He stops, tells viewers the Environmental Protection Agency and the Corps of Engineers, by golly, would not allow drilling in the 23 million-acre National Petroleum Reserve-Alaska even after “we” waited decades to do just that — all because the evil feds did not want a road built there. He fails to mention he is referring to evil feds directed by his pal, Barack Obama. Really? All by himself? Whatever happened to Republican Sen. Lisa Murkowski, who has been locked in a protracted, bitter battle with the EPA over that very road and a management plan in which the Obama administration, to appease greenies, put half the petroleum reserve off-limits to exploration? It has been so bad that Murkowski’s office has been forced to hire at least one lawyer simply to deal with the recalcitrant agency. He is not, apparently, stepping up to take credit for any of that. That is quite a stretch. Begich was not even in the Senate when Shell Oil in 2005 and 2008 acquired federal exploration leases in the Beaufort and Chukchi seas. Yes, he has played a role since his election but so have many others. Whether the Arctic can even be considered “open” to drilling now is questionable. Nobody, including Shell, which first drilled in 2012, is drilling now, and environmental and legal questions loom large for anybody who wants to. Shell had planned to drill during the summer of 2014 but a court put the kibosh on that when it sided with environmental groups that claimed the federal government, in awarding the leases in 2008, had underestimated the extent of how much oil drilling would occur. Despite Begich’s claims, oil companies in the 1980s and 1990s punched a handful of wells in the Chukchi Sea and dozens more in the Beaufort — all without Begich’s help, it turns out — but they were uneconomic. The efforts to drill in the Arctic, develop the 1.5 million-acre coastal plain of the 19 million-acre Arctic National Wildlife Refuge and open the NPR-A have been a decades-long fight for scores of Alaskans and others who have tangled with federal agencies indifferent to Alaska’s needs or the nation’s security. 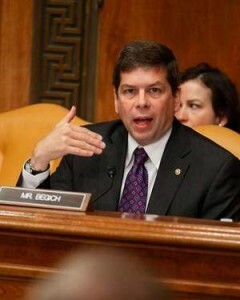 Begich is a Johnny-come-lately to the battle. Congressman Don Young. Governors past and present. Senators and congressmen from other states. Murkowski, father and daughter. The late Republican Sen. Ted Stevens, who became the target of crooked federal prosecutors, whose misdeeds and illegal shenanigans paved the way for Stevens’ bogus corruption conviction and Begich’s razor-thin election win. All have served Alaska in the long war. Stevens, by the way, led the 1995 effort that won approval of ANWR coastal plain development, only to have it vetoed by Democrat Bill Clinton. If Begich wants to take credit for something, he ought to take credit for the fiscal mess he left behind from his days as Anchorage mayor. Nobody would argue with him about that. In the overall scheme of things, nobody cares if he stretches the truth in campaign ads — they’re political ads, after all — but it would be nice if he gave credit where credit is due. He is, after all, standing on the shoulders of giants. Paul Jenkins is editor of the AnchorageDailyPlanet.com.